Take a look at 20 gorgeous silk sarees inspired by South India. This winter, try them out and look gracefully stylish! Now that the summer wedding season has nearly come to end and in no time, we shall all be gearing up for the beautiful winter wedding season, so why not try out something equally attractive for that time? I love plain silk sarees with booties or golden borders. Besides, silk is my first choice for winters. It is graceful, comes in gorgeous colors, has lovely embroidery and that makes it extremely popular within the category of sarees. And, the Indian wedding time is all about flaunting bright colors, wearing an extra dash of glitter, looking glamorously festive. That’s why today, Zuri brings to you 20 elegant Indian bridal sarees that draw their inspiration from South India. There are mainly 4 types of silks: (i) Mulburry, (ii) Muga, (iii) Tussore, and (iv) Eri silk. 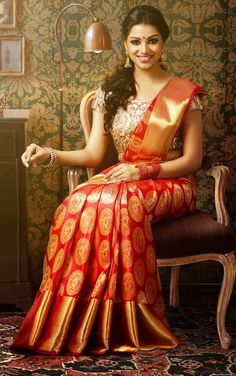 Of all the states/cities that specialize in silk sarees, southern part of India tends to dominate! Karnataka, Andhra Pradesh, and Tamil Nadu are the major hubs of Indian silk industry. The traditional silk sarees like the Kanjeevaram sarees, Konrad sarees, Mysore silk sarees, Pochampally Ikat sarees, etc. are the high-end creations that reflect the true craftsmanship of artisans. If you are the bride-to-be, we highly recommend atleast one silk saree in your wedding trousseau. It is a timeless piece that can be passed on from one generation to another. Even if you happen to be the bridesmaid for an upcoming wedding, do try out this wonderful garment. You can obviously drape it in a unique fashion. Maybe go for a halter neck or a backless blouse. And if you are the mother/mother-in-law of our pretty bride, then South Indian silk saree is ideal attire for the wedding day! 1. Kancheepuram saree is known its innovative color contrasts. What makes it stand out from other varieties is the ‘motif’ it embodies. Pyramidical temple borders, checks, stripes and floral “booties” are traditional designs you will find in a traditional Kancheepuram saree. The reason why a Kancheepuram saree is expensive is for it requires interlocking of 3 differently woven cloths. The border, body, and pallu are woven separately and later joined together. 2. Mysore saree is known for its vivacious color theme and represents a minimalistic theme. This silk is easy to wear and super-versatile. 3. Konrad saree has a wide border and motifs based on Indian deities. But, these days they also come characterized by paisleys, peacocks, and elephants.For an ultimate festive look, you can go for mehndi design with similar motifs. Browns, gray and off-whites are the traditional colors of these sarees. When dressing up in South Indian saree, do make sure to go bold with your eye makeup. Pick from the best eyeliner style that suits your eye shape, wear a lot of kajal and don’t underestimate the power and strength of voluminous eyelashes, all thanks to our gracious mascara. Go for glittery eyeshadow. You can match your lips with the base color of your saree. Orange, pink, red, brown.. And, opt for an updo with a bit of a twist. Don’t forget to accessorize your hair. If you want to leave you hair open, then go for central parting. Aren’t you looking hot? Very beautiful ideas given !